The Dilmun Club, Saar, is hosting a kids’ disco and bingo. It runs from 5pm-6.30pm and costs BD2 per child inclusive of a buffet and soft drink. Both members and non-members are welcome, with normal guest fees applied. The Ramee Grand Hotel & Spa, Seef, hosts a Seafood Night every Thursday at its Lemon Tree restaurant. On offer are lobsters, shrimps, octopuses and more. The cost is BD14++ for adults. The restaurant is also hosting special lunch buffet specials at BD9 net, inclusive of soft drinks, from Sunday to Thursday from 12.30pm-3.30pm. Smile Initiatives, a subsidiary of Future Society for Youth, is aiming to support children with cancer by hosting its third annual ‘Kids-R-Golden Walk-A-Thon’ at the Prince Khalifa bin Salman Park in Hidd, from 3pm-8pm. To register, email info@bahfuture.org or call 17725517. Syrian-American photographer Sueraya Shaheen is presenting an exhibition, called ‘Encounters’, at La Fontaine Art Centre, Manama. It features a collection of 25 different portraits of artists working across the region. For more information, call 17230123. Throughout March, KLM Airlines and the Mövenpick Hotel Bahrain are partnering up for all Friday brunches, with flight tickets to Abu Dhabi and back being raffled every week. On the last Friday of the month a return ticket to Europe will also be up for grabs. For more information, call 17460000. The Baharat restaurant at Le Meridien Bahrain City Centre is hosting a ‘Fizz Fare’ brunch running from 12.30pm-4pm. The fizzy brunch costs BD30 net, the soft brunch costs BD20 net, kids between six and 12 are half price, while kids below six eat for free. Royal Golf Club’s Links Friday Carvery Brunch features a range of starters, live cooking stations, traditional carved meats, desserts and more. Furthermore, reservations are now being taken for the Easter Family Brunch which will take place on April 3. There will be a range of food stations including a special cup cake decorating stand for youngsters alongside a giant Easter Bunny and Easter Egg Hunt. Prices are the same as the regular brunch. The hotel’s Tea Garden Café also has a ‘High Tea’ offer, which includes a collection of tea, pastries, sweets, sandwiches and cookies every day from 3pm-6pm for BD7++. Boxing legend Ricky ‘The Hitman’ Hatton will be presenting a talk about his career, his take on the world of boxing new and old and also his views on football and his beloved Manchester City, at the Diplomat Radisson Blu Hotel, Residence & Spa tonight from 7.30pm. The night will also include a comedy performance from the UK’s Peter McCole, a five-star gourmet dinner, live music from Bahrain band ‘The B Side’, a prize raffle giveaway and a boxing and football memorabilia auction. Saudi artist Faisal Samra is hosting an exhibition titled ‘Global Warming’ at the Bin Matar House in Muharraq. It will run until April 26. The Bin Matar House is open Saturday to Thursday, from 9am-1pm and 4pm-7pm. To celebrate International Women’s Day a month of Women’s Day celebrations will be held at Sofitel Bahrain Zallaq Thalassa Sea & Spa with a Woman’s Night Out promotion. Ladies can enjoy a 50 per cent discount in all restaurants and bars every Monday throughout March. Soccer returns to the Bahrain Rugby Football Club in Saar on Friday, when the 17th annual 6-A-Side Football Tournament, organised by the Rotary Club of Manama and Rotaract Club of Bahrain, kicks off to raise money to help support children in need. This year organisers are creating a carnival atmosphere around the event, with special attractions for children during the day and live music in the afternoon and evening. In fact, a full day out for all the family! All funds raised will go to screening and helping children with diabetes, financial support for the campaign to curb and eventually eliminate the scourge of sickle cell and other genetic blood diseases and organising events and days out for orphans and children with disabilities. Thirty men’s teams and seven women’s teams will be taking part, and more than 400 people are expected to gather to watch the annual competition entitled ‘Kick for a Cause’. The action starts at 9am and will finish by 3pm. There are all-day activities for children and, from 3pm to late, there will be two bands and a DJ. DHL is the main sponsor, and corporate team sponsorships and in-kind donations have already generated more than BD20,000 from a number of companies including Al Hilal Group, Alkomed, APM Terminals, Al Rashid Group, Al Sharif Water Plant, Al Zayani Investments, Ashgharali, Bader Trading, BBK, Bin Hindi Group, BMMI, BNH, BNP Paribas, BRFC, Budget Rent-A-Car, Chevron, Citi, Coca-Cola, Domain Hotel, Gulf Hotel, Intercol, International Investment Bank (IIB), Mesk Holdings, Motor City, Palace Enterprises, RCSI Bahrain, SICO, TRA, Trowers & Hamlin, Upstairs-Downstairs Restaurant and Yateem Air Conditioning. School and club teams will also compete such as Al Noor International School, Arsenal Soccer School Bahrain, British Army, Dhahran Exiles (KSA), Eastern Flames (KSA), Sibleys, Soccer Stars, University College Bahrain and Venus. Renowned chart-topping musician Pitbull will take to the stage in Bahrain next month as the headline act of the Formula One at the Bahrain International Circuit (BIC) in Sakhir. 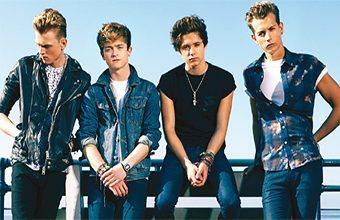 He will be performing on April 18 as part of an extensive line-up that also includes British band The Vamps, pictured right, and Swedish DJ Otto Knows, who will perform on April 11 at the Rave Fever event held in the lead-up to the F1. Those with tickets to the Grand Prix weekend will be able to attend the concert. * Tickets to the 2015 Bahrain F1 can be purchased at the BIC sales outlets in City Centre Bahrain and Seef Mall, online at bahraingp.com or by calling the BIC Hotline on 17450000. The Chuckle Club Comedy Night is bringing another three shows to the kingdom this month, featuring comedians Andrew Ryan, Johnny Pemberton and Jojo Sutherland. The first will be at the Rugby Club, Janabiya, on March 18, with a show at the British Club, Um Al Hassam, on March 19, and one at the InterContinental Regency Bahrain on March 20. Doors are at 7.30pm for the first two shows, and 3pm for the third show. Tickets cost BD15 for the first two shows, while the third will be BD30++ inclusive of brunch at the hotel. For further details, call 17750777. The American Women’s Association (AWA) will be hosting the ‘VISIONS Art Exhibition’, showcasing fine art & photography, at the Swiss-Belhotel Seef, from March 18-21. All pieces on show will be for sale. The event opens on March 18 at 7pm. A special Ladies Morning will be held on March 19 from 9am-1pm. The exhibition will be open from 9am-9pm on March 19-20 and from 9am-7pm on March 21. Ebrahim K Kanoo will hold the ‘9th Toyota Dream Car Art Contest’ until Sunday. The contest invites children to share ideas about the future of mobility by drawing their dream cars. The contest is categorised into three age groups; under eight, eight to 11, and 12 to 15. The drawings can be submitted at one of the following locations: Toyota Showroom in Sitra, Toyota Plaza in Tubli, or Ebrahim K Kanoo Head Office, Marketing and Communication Department in Manama. The artworks will be judged by a local committee and five prize-winners will be selected from each age category. The first three winning artworks per category (nine winning artworks in total) will be taken to Toyota’s HQ in Japan to participate in the car giant’s ‘world contest’. For more information, visit www.toyota.com.bh/dreamcar or contact Ebrahim K Kanoo’s Marketing Department on 17264646.